We specialise in sales, service and spare parts for the entire range of pre and post war Rolls-Royce and Bentley motor cars from 1904 to the present day. 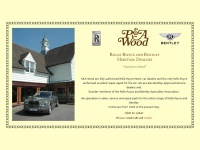 two profiles were found for Pa-wood.co.uk in social networks. Among other social networks the website is represented in Facebook and Twitter. The web server with the IP-address 77.72.4.226 used by Pa-wood.co.uk is run by Krystal Solutions LLP and is located in Great Britain. There are many websites run by this web server. The operator uses this server for many hosting clients. In total there are at least 194 websites on this server. The language of these websites is mostly english.